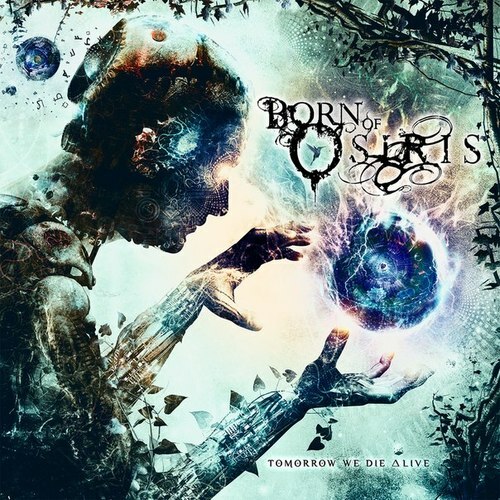 Born of Osiris is a death core (metalcore and death metal) band from Chicago, Illinois. They have two previous full length albums which are, A Higher Place(2009), and The Discovery(2011). Personally I only listen to Born of Osiris occasionally when it pops up randomly on my ipod, but this album will easily find its way onto repeat. There’s something about the “Tomorrow We Die Alive” album that brings a new energy and light that I’ve never seen in this band before (again just personal preference). The album “Tomorrow We Die ∆live” features 11 songs, and never gets boring. The combination of high tempo guitars, percussion, piano/synth and vocals blend together very nicely compared to what I’ve listened to before. I’ve always been a little hesitant and judgmental listening to bands that are branded as the genre “death core”, as I expect a lot more heavier guitars and heavier/deeper screams, but when I listen to this album I don’t hear too much of that, which really surprised me. Each song has been structured perfectly to a tee and keeps you wanting more and wondering what the next song is going to sound like and incorporate. Although I cant say Born of Osiris has worked its way into my “Top 5 favorites” it will easily be a frequently listened to album. I rate this album an 8 out of 10 based on the song structure alone. Each song was constructed amazingly and shows the true talent and time they took in creating this album. Definitely worth a listen even if you haven’t been very fond of them in the past. I like each song as much as the next song but my 3 recommended tracks off this album would be: Divergency, ∆bsolution, and Venge∆nce. Well they’re not deathcore…more just progressive. They remind you of Alesana? Really? Well, they’re definitely a mix between deathcore and progressive, but maybe you’re definition of deathcore isn’t the same as the writers. Haha. But thanks for the input again man. I was totally thinking this album sounds like alesana on steroids! Great review and great album, thanks Shaine and sleaksmusic!